A month ago The Sims Team introduced a brand new Trait to The Sims 4 that took a series of steps to be unlocked through a limited time challenge. Basically, the Positivity Challenge which featured the Sims Ambassador Millie Bobby Brown would unlock a new Challenge Aspiration that you would need to complete through series of interactions in order to unlock the Positivity Ambassador Trait. We have the entire article about the challenge written HERE! However, now that the Positivity Challenge has ended there’s no way to officially obtain the trait in the game…at least not through gameplay or user interface options. With a simple cheat you are able to fully obtain the official Positivity Ambassador Trait. Even though the Positivity Challenge is over this trait will remain in the game forever, meaning that you’re able to use this cheat anytime you want to make your Sim a Positivity Ambassador. Simply open up the cheat console using CTRL + Shift + C and enter the traits.equip_trait Kindness_Ambassador cheat and press Enter. You’ll immediately find this cheat in your Sim’s Simology panel. 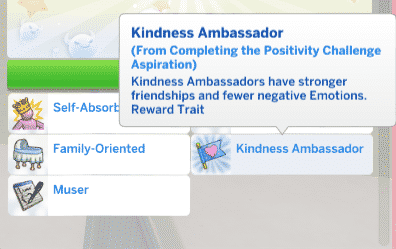 So, which benefits do you gain with the Kindness Ambassador Trait? First of all, you get to worry less about the negative emotions which may impact your Sims from time to time as your Sims will strive to focus on brighter things in life. Second, your Sims will build friendships and remain friends with other Sims for a longer period of time. The new trait also offers you to “Challenge Sims to Be Kind” by clicking on a Sim of your choice. 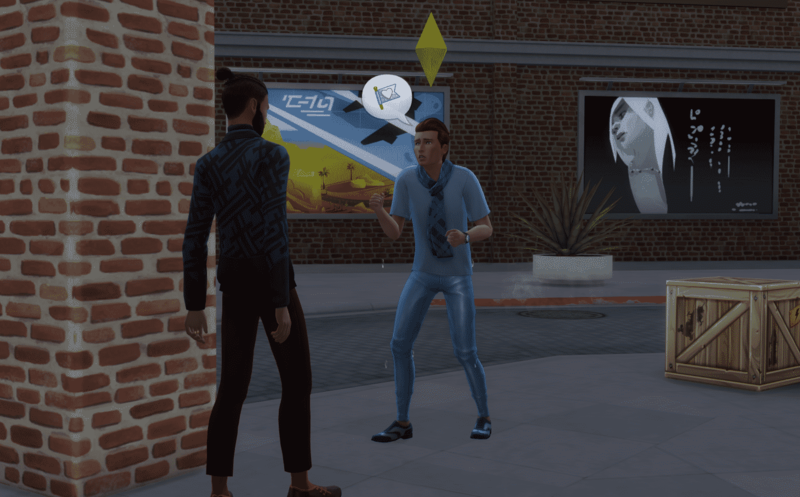 This interaction might affect the autonomy of the Sim you’ve chosen to perform this interaction on and make them much kinder towards others. Huge thanks to @EuphorialQueen for helping us uncover this cheat! As much as I like different things like this challenge, there’s already plenty of kindness within the game itself. At least with GF it introduces a whole lot more ways to bring negative things onto your sims.